The company has successfully managed to shrink the read-write head of a hard drive to two thousand times smaller than the width of a human hair. Hitachi said the advance would fuel the "terabyte era", with a 4TB drive able to hold more than a million songs. 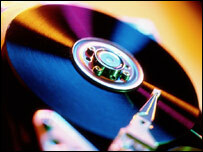 Hard drives store data by magnetising the surface of the disk in a pattern which represents the data in digital form. The data is stored digitally as tiny magnetized regions, called bits, on the disk. A magnetic orientation in one direction on the disk could represent a "1", while an orientation in the opposite direction could represent a "0". To store an ever increasing amount of data, the magnetised regions on the disk are packed ever closer together, requiring smaller and smaller read-write heads. Current hard disks can store about 200 gigabits of information per square inch (6.4sqcms) while Hitachi believes its new technology means it can store up to 1 terabit of data per square inch. However, as the heads get smaller the amount of electrical resistance grows, generating noise output and adversely affecting the head's ability to read data off the disk. Hitachi's solution is to return to a technology which spurred an explosion in hard disk storage 10 years ago and led to the Nobel prize for physics last week for French scientist Albert Fert and Peter Grunberg of Germany. They discovered the phenomenon of "giant magnetoresistance" (GMR), in which weak magnetic changes give rise to big differences in electrical resistance. The knowledge allowed industry to develop sensitive read tools, called GMR heads, to pull data off hard drives in computers, iPods and other digital devices. In recent years GMR heads have given way to so-called tunneling magneto-resistance (TMR) heads, which have been able to read more densely-packed disks. However, Hitachi has discovered a method of reducing noise and boosting signal output when using GMR heads and so further increasing the density of data on a disk than can be read. "We changed the direction of the current and adjusted the materials to get good properties," said John Best, chief technologist for Hitachi's data-storage unit, in an interview with AP. "Hitachi continues to invest in deep research for the advancement of hard disk drives as we believe there is no other technology capable of providing the hard drive's high-capacity, low-cost value for the foreseeable future," said Hiroaki Odawara, Hitachi's research director, at its Storage Technology Research Centre. Hitachi predicts it could release a hard disk for desktops with 4TB of storage and a laptop with a 1TB drive by 2011. The company said this would mean hard drive storage would continue doubling every two years.